Foodista | IFBC SaMo Keynote Speaker Announced: Jonathan Gold! 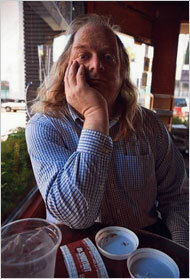 IFBC SaMo Keynote Speaker Announced: Jonathan Gold! We are beyond thrilled to announce the IFBC Santa Monica keynote speaker, Pulitzer Prize winning food writer, Jonathan Gold. Jonathan Gold is a food critic who currently writes for LA Weekly and is a regular guest on KCRW's Good Food radio program. In 2007 he became the first food critic to win the Pulitzer Prize. Gold often chooses small, ethnic restaurants for his reviews, although he covers all types of cuisine. A collection of his articles can be found in his book, Counter Intelligence: Where to Eat in the Real Los Angeles. Gold started out at the L.A. Weekly in 1982 as a proofreader while he was studying art and music at UCLA, and by the mid-’80s became one of the paper’s most popular writers. He’s had several jobs at the Weekly over the years, from caption guru to editor of several of the paper’s Best of L.A. issues. As music editor in the ’80s, he wrote groundbreaking pieces about new-music composers, thrash metal and the L.A. rap scene just as it was going national: Boulez, Metallica and N.W.A. But restaurant criticism is where he really captured people’s imagination in the city. With the encouragement of Weekly founder Jay Levin, he started his Counter Intelligence column in 1986 as a way of exploring Los Angeles’ ethnic neighborhoods, places that often go underreported in other papers. He took the column to the L.A. Times from 1990 to 1996, all the while writing “proper” restaurant reviews of high-end places in California and Los Angeles magazines, as well as music stories for Blender, Spin, Rolling Stone and Details. In 1999, he left Los Angeles to become Gourmet magazine’s New York restaurant critic and was the first food writer to be honored as a National Magazine Award finalist in criticism by the American Society of Magazine Editors. In 2001, he moved back to Los Angeles, where he revived Counter Intelligence for L.A. Weekly.